A meal at the Petersham Nurseries Cafe, just outside London, has long been on my bucket list. Like many amazing experiences, it’s hard to put into words and capture the essence of just what it is that makes it so magical, but I’m willing to give it a try. Hopefully the photographs will help. Picture a pleasantly fogged-up warm glass house, originally designed to grow plants in, a hardened dirt floor, lots of fairy lights and crystal chandeliers, all capped off by an abundance of plants and flowers. This is the main restaurant – reservations are essential. Next door is the Teahouse, which I am sure is delightful in the summer. We were there on a classic British spring day: pouring torrential rain pounded on the glass roof. None of that dampened the sophisticated Boho chic of the place. First up the delicious focaccia and crusty bread, with buttery Italian olive oil. Just the right amount of salt and crunch. Our table of four soon demolished this plateful and asked for more. 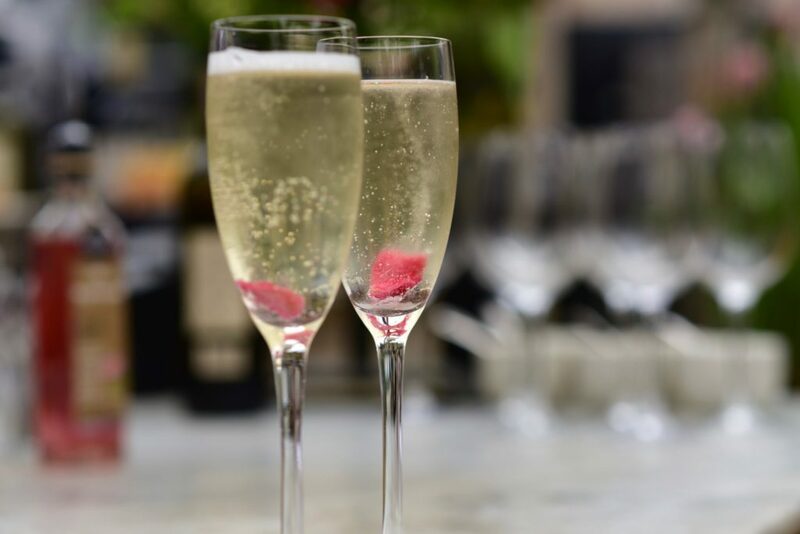 If you’re in the mood, try the special Prosecco cocktail: when we visited this included crystalized rose petals and rose sirop. The menu includes a couple of appetizers: monkfish and dill crochettes and tardivo tips and fennel served with bagna cauda – both priced at £6. The delicate pinkish red of the tardivo tendrils, is just beautiful. In fact, one of the distinguishing features of this heavily Italian-influenced meal is the fact that the natural aesthetics of the fresh ingredients are simply allowed to shine. Tardivo and fennel with bagna cauda. It is artichoke and asparagus season, and so we just had to try both. The Artichoke Giudia (£14) comes with a wonderful thick, creamy saffron aioli, as rich in color as in taste. The chargrilled asparagus was served with a soft-boiled egg (which needed a little salt) and speck (£14.50). Artichokes Giudia with saffron aioli. Chargrilled asparagus, speck and soft-boiled egg. It would seem we were a table of lamb-lovers, because three of us ordered the Chargrilled Leg of Lamb with Jerusalem artichoke and wild asparagus (£27.50). Served rare, it was the perfect post-Easter, spring dish. Chargrilled lamb and Jerusalem artichoke. Monkey was the only one to break the mould by ordering Chargrilled Monkfish with Coco Beans and Tomatoes (£26). He seemed pretty happy with his lot. Chargrilled monkfish with Coco beans and tomatoes. We had a family argument about how many desserts to order. I felt that three between the four of us, was perfectly reasonable. My brother vehemently disagreed. He won. I will say that the desserts were the highlight of the meal. Both were excellent. Rich in flavors and stunning in color. The Original Bean Chocolate with Sea Salt and Pistachio Ice Cream(£8) featured nuts imported especially from Italy. Original bean chocolate and pistachio ice cream. The Amalfi Lemon Semifreddo, included leaf meringue made with chickpea flour and poppyseed marscapone (£8.50). The deep intensity of the lemon was perfectly offset by creaminess. Just wonderful. Amalfi lemon semi-freddo with chickpea meringue. Our bill came to just over £230 – not cheap, but worth every penny for a vacation treat. Our waiter told us that the Italian owners’ intention is that you can sit and enjoy your lunch for up to three hours, so they don’t try and turn tables which is a welcome change to being told you have to leave soon. I wish I was there….right now! It sounds delicious and cozy. Next time I’m in London. Sounds like a must. It truly is a wonderful place – let’s go together!